See how they are completely opposite? In the twisted version, Paul makes his case for a divine messiah who does it all for you on the basis that a person is incapable of doing anything (cf John 6:44). The correct version as per Isaiah 59:20 has individual persons turning from their transgressions! In contradistinction to Paul’s twisting of scripture we have a clear indication in the following which says we can turn fom our own transgressions ourselves! Mastery over sin is possible, indeed as keeping the law is possible too (see Deut 30:11-14). See the subtle agenda in the screen shot for a messianic proselytizing agenda below? The subtle agenda would like us Jews to think that messiah = savior = sacrifice. 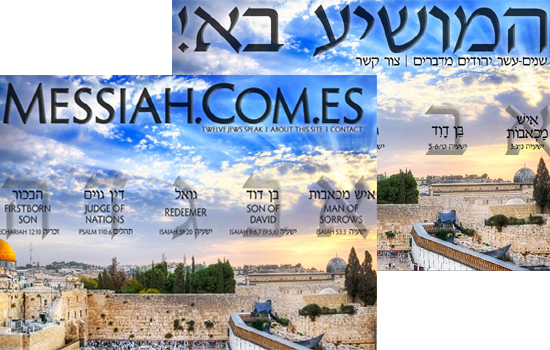 In the English of the website it says Messiah comes, if your not careful you would think that the Hebrew version of the site says the same thing. The difference is by just one letter (at the end) but that one letter makes all the difference! Notice it says משיע but really it should be משיח (messiah). The first as it is shown on the Hebrew web page says savior (משיע) and the second in the English says messiah! A subtle difference because both משיח (messiah) and savior (משיע) are very similarly pronounced but are in fact very different words! This is not a matter of selecting your preferred candidate for president, it’s about redefining whom you worship as G-d and what G-d requires from you. I’m pleading with you with all my heart and soul, please take the time to make sure you understand what you are being asked to reject and embrace before making any life altering decision. May the G-d of Abraham Isaac and Jacob lead you to His Truth as you continue to seek Him in truth. … Another explanation of Hadrach: this is the Messiah who will guide (hadrich) all humanity in the way of repentance before the Holy One, blessed be He. can u deny that messiah will make israel repent ? In the twisted version, Paul makes his case for a divine messiah who does it all for you (on a cross) on the basis that a person is incapable of doing anything (cf John 6:44) and if anything is done is worthless too. The messiah does not do it all for you so you do not have to. You have to repent and the job of the messiah is to help you repent. first can u explain plz what zach 3: 9 said? You are struggling Menashe. Messiah, Savior, One and the same. It is a game of semantics you are playing. And to be totally honest the nation went into captivity and has languished for 2000 years because of a stubborn heart towards the love of Yeshua. You perpetuate the suffering of your precious people. This is a tragic. That you would read the Torah with insight and understand about Joseph and Moshe and have your eyes opened. Messiah and saviour are not the same words and if you knew Hebrew you would know this. This is correct. Menashe is right … ‘yeshua’ means ‘salvation’ and ‘messiah’ or ‘moshiach’ means … “anointed” … as with oil for one chosen as a priest or a king … obviously none of those terms apply to Yeshua ha Moshiach. Right? How could they? But Menashe is right the 2 words are different in Hebrew. Nice try. Israel went in to exile for reasons of baseless hatred toward one another (Jewish), and idolatry, NOT because they rejected Jeebis. Same worn out Roman claim. Yawn. I bet the muslims love blogs like this, distracted by crossing swords with each other, majoring in minors, while they break down our institutions. Menashe Walsh what exactly is the purpose of your blog and postings? 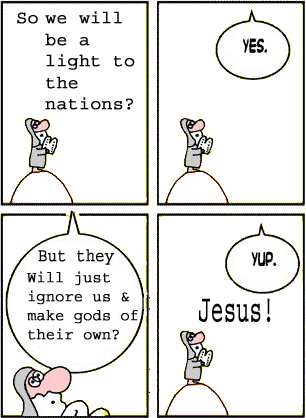 To draw the nations to Judaism? Not with the attitudes I see presented here. To honor G-d? You drive the very people who need His truth away. To be a teacher is a great responsibility and burden to be taken seriously lest you offend the G-d of Israel. In reading your posts and this blog it appears to me that you Menashe are more interested in stroking your ego than honoring G-d and His Torah. This is something for Jew and non-Jew to remember: 19 I scattered them among the nations and they were dispersed among the lands; according to their way and according to their acts did I judge them. 20 They came among the nations where they came, and they desecrated My holy Name when it was said of them, ‘These are the people of HaSHEM, but they departed His land.’ Ezekiel 36. Dear (??) You presume too much after all we are not even acquainted. I did send you an e-mail but you never replied. Muslims have not expressed any interest in this blog. My encounter with Islam you may find interesting: https://menashedovid1.wordpress.com/my-islamaphobia/. A purpose of my blog is to address a number of issues, one of which is the the skewed ego driven agenda of missionaries who claim that Jews are spiritually blind and closed minded etc.. The ‘want you Jew’ / ‘do not want you Jew’ bipolar disorder of missionaries is also addressed here also. Perhaps you may wish to introduce yourself? May be even address the issues raised in this post without resorting to personal insults and presumptions? Paul T Rumaker (paulhimself), at your service, it’s my mistake not realizing you wouldn’t recognize an additional persona I’ll be using on a soon to be published blog. My purpose was not to insult you, I have respect for your knowledge, but I question your tactics. You’re email came at a time I had just signed up for a blog site and I thought it was from WordPress (I got the idea for a blog from you and I truly hope to see you there.) I don’t know if muslims come to you’re specific site or no (I’m often surprised at the drive bys who hit some of the sites I’m involved in.) I was speaking of Jew/Christian disputes in general. Not being a missionary I’m more concerned with the war Christians and Jews are fighting (and have been fighting for centuries) against Islam which seems to have the capability, due to lax political leaders, of overwhelming us both. To a Christian wanting to learn about Jews and Judaism (yes, Christian roots) you’re comments both here and elsewhere seem to have a big “GET LOST” mat at the front door. Are there Christians who hate Jews in this day and age, you bet! Are there Christians who love, support and care about Jews and the Jewish nation, you bet! In your works, Menashe, you don’t differentiate between the two, and your words seem to go out of the way to insult the haters, the indifferent and the supporters of the Jewish people as one and the same. Jews and those who stand with Jews and Israel will not survive this war, if we do the work of our enemies first. 27 But those enemies of mine who did not want me to be king over them–bring them here and kill them in front of me. It’s within a Christians spiritual and physical nature I am afraid!! Good to see ping backs! Great article…. so simple and they choose blindness… keep the great work! !